Playlist Grouping Individual Song's into 1 "Album"? So i don't remember the name of the skin im using as i've had it for over a year, but a have a collection of song's that are my favorites (hundreds are in this collection) and when I place them in my playlist, they are each in their own "Album", which is really dissorienting. I have them all sorted into folders for each "Volume" of the collection, so id like for the tracks to stick together as an "Album", but they have different artists. Is there a way I can do this at all? Here's an example of how it currently is, notice how they are all seperated. I want them together as an "Album" or by the folders i have them in. Re: Playlist Grouping Individual Song's into 1 "Album"? This looks to be Elplaylist. If it is, if you right click and select the grouping tab there's a group format, that's where you change the way Elplaylist groups elements. Probably the way it is grouped now is something like %album artist% ||| %album%. Essentially you would need a different grouping preset that negates any album grouping. You say you have them grouped into separate folders? Try creating a new group format preset and change %album% to %directory% in the group format. Once you made an extra grouping pattern preset you can select the preset by right clicking in the playlist viewer and select the appropriate group preset needed. 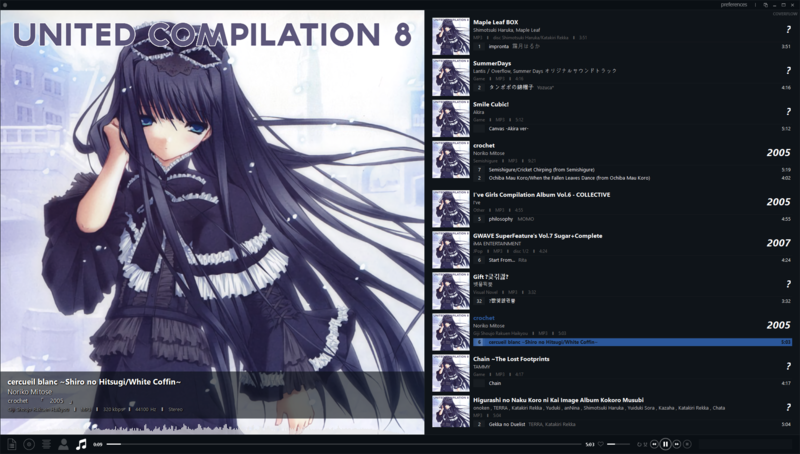 You should realize, this particular ELplaylist script is made to function as an album grouping. Changing it would group it under one header but it wouldn't make much sense as it isn't really an album group anymore. It will still show an album name, date and cover of the first row file and show the directory as if it's that album. Unless the creator of the config already foresaw alternate grouping patterns with scripts to match it. Thanks for all the advice and instructions! I checked the grouping and it's set to a preset called "Rikitiki" which im assuming is just a random name they put in. So i'd just need to create a new preset with %directory% in it right?